They do this for ambulances. I think it makes sense to use this sign to warn drivers ahead of them. I haven't updated the website in a couple of weeks because I've been on vacation. I tried to look at the email I get, but I was busy and figured there wasn't anything really urgent. If it was urgent, I would have gotten the email weeks ago. I especially ignored any mass-mailings. Now's a good time to send in the information on your events for the start of the September dance season. At one of the rest stops on the New York Thruway, I got coffee at a Roy Rogers because it's against my religion to drink Starbucks coffee. That was a bad mistake (that is, drinking Roy Rogers coffee, not the part about Starbucks; see my new t-shirt). I took one sip and just put it down; I dumped the whole cup at the next rest stop and got coffee from McDonald's instead (it was "Newman's Own" or Green Mountain, I forget which). It would appear that Roy Rogers doesn't have a pot of coffee ready for customers, probably because Starbucks was next door. They had some dispenser that seemed to mix hot water with some coffee-colored syrup as it comes out, like the coffee from a vending machine. It was just slightly thicker than hot water...and less flavor. I wonder if the restaurant chain ever considered that this just might encourage customers to *not* try out the rest of their menu? I know I'll never eat there. The New York Thruway (I-90) has lighted signs over the highway showing some of the services at the rest stops. What a great idea. When it's dark out, it's hard to see the signs on the side of the highway as you speed by them. In case you're ever wondered, it's worth getting your passport and going over to the Canadian side of Niagara Falls. Hanging out until evening to see the lights on the falls is well worth the wait. 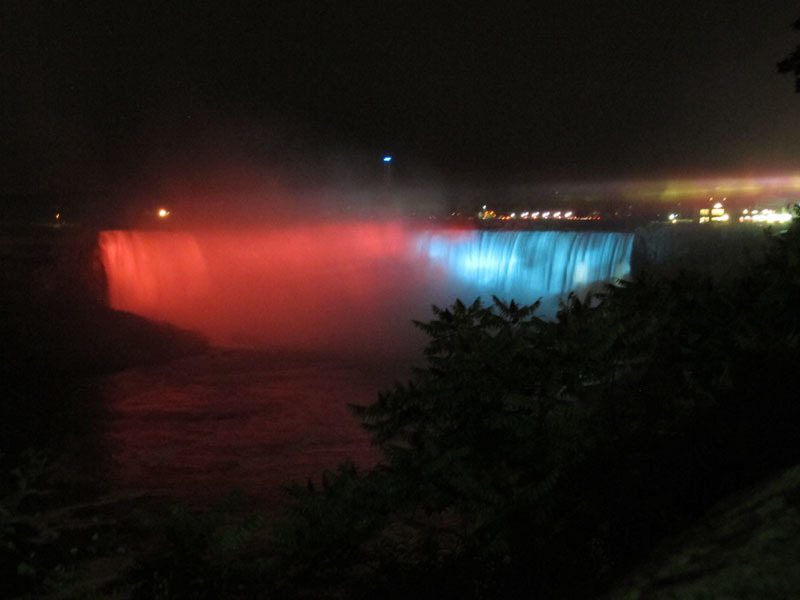 Did you know they had fireworks at the falls on Sundays at 10 pm? It's also a great idea to wait as long as possible to go back over the Rainbow Bridge. There's no one on the bridge at midnight. The previous bridge was called "The Honeymoon Bridge" and it collapsed in 1938. While they had already been planning to replace the bridge anyway, I find the irony amusing. The Hard Rock Cafe on the New York side is a corporate store; all the prices in their store are the same at all the corporate store. 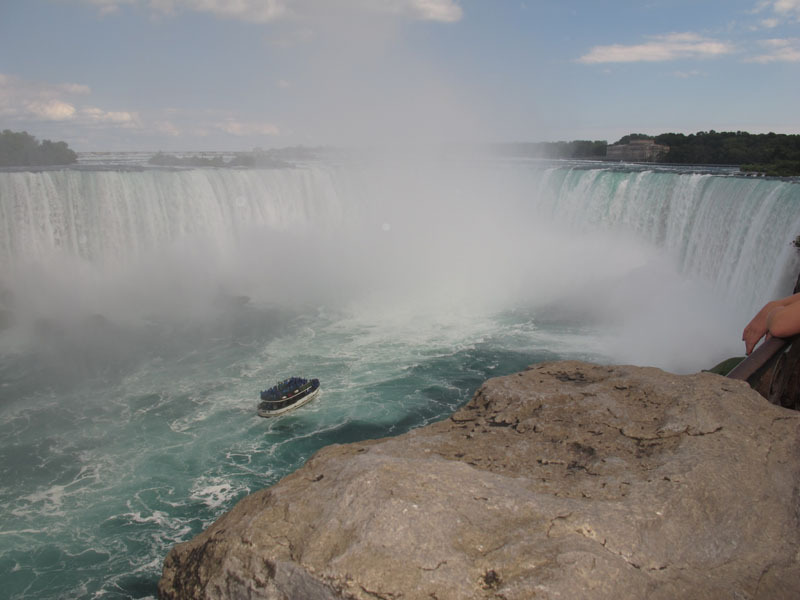 However, the place on the Canadian side of the Falls is a franchise; they can charge anything they want, even when the Canadian dollar is worth exactly the same as the American dollar. I felt that $32 for *t-shirt* was a really stupid idea. As a former Canadian, I always thought Canadians were really nice people in general. This time, though, I had an American witness along. A waiter at Planet Hollywood helped me find the one 24-hour grocery store (Sobeys) on the other side of town to get reasonably priced Maple Leaf cookies and "Canadian" maple syrup (the tourist traps at the Falls charged double). It was midnight at the grocery store when we paid for our purchases and one customer-oriented store employee chased us down to hand us written instructions to the nearest 24-hour drug store (again for the maple leaf cookies and maple syrup). Those people uphold the Canadian tradition well. Oh yeah, I just remembered. Every once in a while, some dance promoter will come up to me and start whining about how people are going to other venues and not going to their own. I probably made suggestions that no one bothered to listen to, probably because the ideas involved actual work and/or money. After passing through a lot of hotels and highway rest stops between Boston and Chicago, I keep wondering why the local (Boston) dance promoters don't just drop off their dance brochures at local hotels for people who are looking for things to do in town. Maybe they should just pay someone to to check out every hotel and drop off everyone's flyers at the same time.